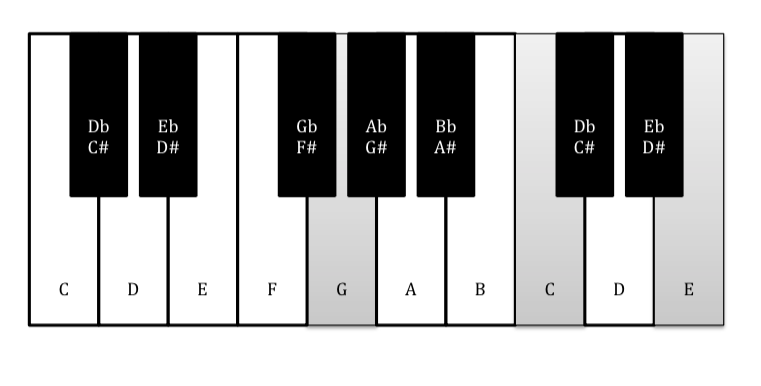 The component notes of a chord can be reshuffled in any order. It will still remain the same chord but no longer be in ‘root position’ (the root being determined by the lowest note). It instead becomes what is known as an ‘inversion’. 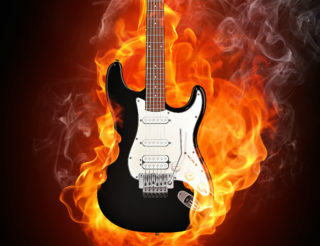 This generally applies to any chord or triad containing just three notes but also works with seventh chords or indeed any chord with four or more notes. To illustrate this, we have our trusty piano keyboard to hand. Our chord here is a C triad consisting of C (the root), E (the 3rd) and G (the 5th). However, both of these ‘new’ chords are still called C major triad! G / C / E we call 2nd inversion. These are denoted by slightly different chord symbols. We call the 1st inversion C/E, which is read as “C over E”. Similarly, the chord symbol for the 2nd inversion is C/G, or “C over G”. These are two examples of “close voicings”. This means that all notes are placed within a one octave spectrum. Using spread voicings does not alter the chord symbols (C/E or C/G). The symbols are determined by the root note (which remains C), and the lowest note, which are E and G respectively. Don’t get confused by the changing intervals within the inversions. 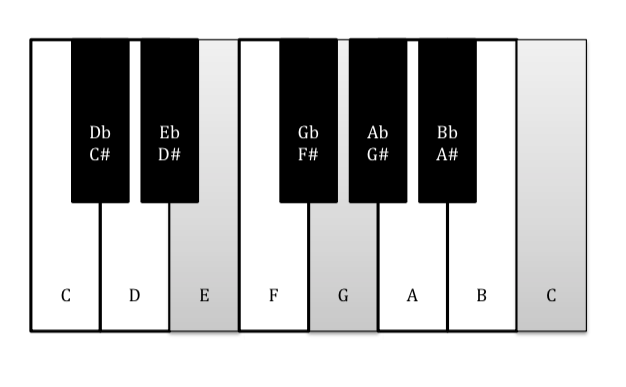 In the 1st inversion we have a minor third between E and G and a perfect fourth between G and C. Between the lowest note E and the highest one C we have a minor sixth. Hopefully you’ll have learned about intervals and their inversions in our previous post dedicated to the topic. An interval always sounds close to its inversion, so instead of a major third between C and E in the root position we now have a very similar sounding minor sixth between E and C in the 1st inversion. Instead of the perfect fifth between C and G in the root position, we get a similar sounding perfect fourth between G and C in the 1st inversion, and so on. 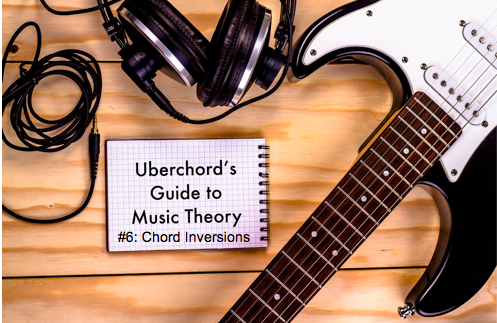 This is why any inversion of a chord still sounds relatable to its parent root chord. 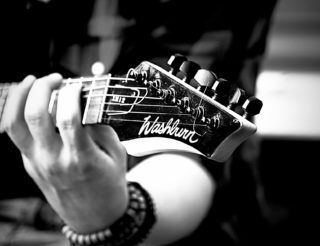 This is important to realize as the “regular” close root position voicing of any triad is often difficult or indeed impossible to play on the guitar. Why? 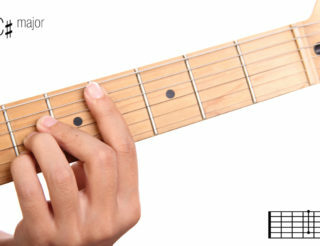 Because the intervals between chord tones are thirds, whereas the interval between guitar strings is a perfect fourth, with the sole exception of between the G and B strings. X 3 2 0 1 0 which gives us the notes C E G C E.
To add an inversion, we can simply play the same chord and add the open low E string to get C/E – the 1st inversion. The bold notes are the ones, that both voicings have in common. This is actually the simplest and cleanest explanation of inversions ever. Laying it out on a piano helped.